Polar Bears jump into the Atlantic Ocean during last year’s event in Lewes. This year’s event will benefit SODE. The 28th Annual Lewes Polar Bear Plunge in support of Special Olympics Delaware (SODE) will be held on Sunday, Feb. 3, at 1 p.m. by the Rehoboth Beach bandstand. Buzby said that when the plunge first began in 1992, it was run in conjunction with the Lewes Polar Bear Club, and was not the same day as the Super Bowl. In its first year, Buzby said, most plungers were people who had a passion for Special Olympics — long-time volunteers, “They were our coaches, they were our family members and a few athletes. After having to move the plunge to Rehoboth Beach a number of years ago due to the state park closing for a nor’easter, the non-profit realized the potential of holding the event downtown in the resort town. 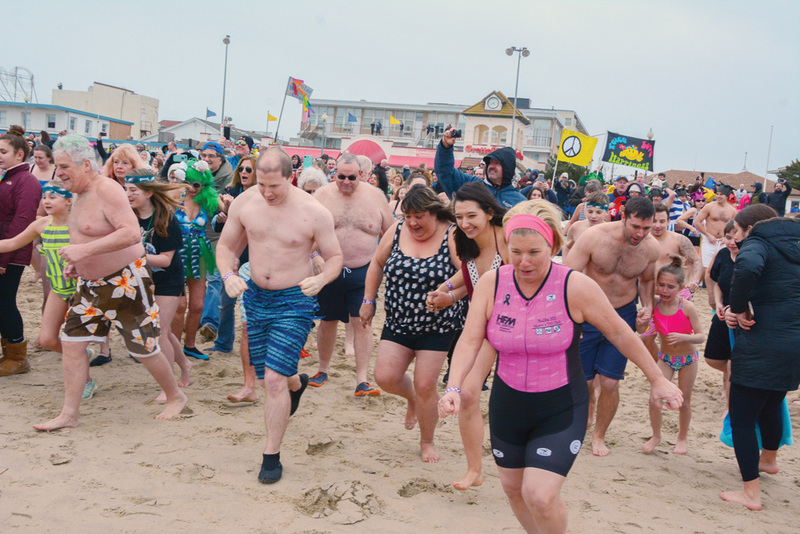 And with the event growing to nearly 4,000 plungers each year, the weekend has become more than just a quick dip into the ocean. “We created the weekend festival. It all started with the businesses offering our Bears discounts,” explained Buzby. “That was a way to get the businesses involved and, of course, the businesses wanted to be involved, because it’s one of the busier weekends, if not the busiest weekend, of the winter season. On Saturday, Feb. 2, there will be a sand-sculpting demonstration from 11 a.m. to 3 p.m. on the beach south of Rehoboth Avenue. A culinary Fire & Ice event featuring ice cream and wing samples will take place at the Rehoboth Beach Fire Department from noon to 2 p.m. (or while supplies last). The 5K Run to the Plunge will begin at 1 p.m., and the Restaurant Chili Tasting Contest will run from 2:30 p.m. to 5 p.m.
“We thought, ‘How else can we engage the City of Rehoboth and what else can we give the people of Rehoboth to do?’ Over 500 people take part in the Chili Contest. For $10, you get to go around to 12 to 14 different restaurants and sample their chili. That has become a very popular event. We say, probably of all the events, that’s the one where most people come and do and don’t plunge. Those who participate in the plunge can register and/or check-in at the newly renovated Rehoboth Beach Convention Center. Those who wish to do so on Sunday should visit the tents near the bandstand on Rehoboth Avenue. The event’s presenting sponsor is Wawa, with supporting sponsors Cape Gazette; Delaware Law Enforcement for Special Olympics; Delmarva Broadcasting Company; Fox 21 Delmarva & WBOC-TV 16; Jack Lingo Realtor; the Lewes Polar Bears; and Irv & Phyllis Levin. In its 27 years, the plunge has raised a total of $11 million for Special Olympics Delaware. Buzby said Delaware is the only state in the country where an athlete participates completely free of charge, regardless of their family’s income bracket. Buzby said the plunge is the largest fundraising event for SODE every year. “We’ve been lucky. It’s become kind of a bucket-list item for some people. It’s become an annual get-together for others. It’s become a first-time thing, often done on a dare. “It’s our largest fundraiser, not only in terms of dollars, but — just as importantly — in the number of people we are able to touch to make them aware of our program, and the benefits for all of the athletes. Last year, 3,383 Bears took the plunge into the 37-degree waters, raising $875,000. “Special Olympics Delaware offers 19 sports year-round and it gives our athletes the opportunity to reap the same benefits of being part of sports that everybody else benefits from,” said Buzby. “It increases their self-esteem, they become more physically fit, they develop confidence. “Our hope is that all of that will also overlap into their everyday life. If they are participating in a church bowling activity, they know what they’re doing because they’ve experienced it through Special Olympics. They know how to roll the ball, they know they need special shoes, they know how to keep score. For more information about the Lewes Polar Bear Plunge, visit www.plungeDE.org. For more information about Special Olympics Delaware and their programs, visit www.sode.org.